The last time I made this I was wearing bell bottom jeans which had been split at the hem to insert a flowered cloth panel to make them even more bell bottomed, a tie-dyed t-shirt that I dyed myself and Cat Stevens was playing in the background “Ooo baby baby it’s a wild world”. A couple of weeks ago a message came through from Food Buzz offering coupons for Fresh Express salad mixes. Since I eat salads practically every day for lunch and buy Fresh Express salad mixes and salad kits often, I jumped on my first “freebie” offering. To receive the coupons you had to reply with what you were going to make out of Fresh Express packaged salad mixes and agree to blog about it. At this point, I experienced my first ever official flashback and this old Taco Salad recipe popped into my head. Between this recipe and boxed Kraft Macaroni and Cheese (which I swear has drugs in it to make it so good, hence the official flashback) this is what I lived on while receiving my higher education. I’m assuming this recipe was on a Kraft Catalina dressing bottle, but however we found it, it was a staple. I honestly haven’t made this in ages. I don’t have a recipe, it doesn’t appear in my official lifetime recipe data base, but I made it often enough in College that I thought I could whip it right up. Old Fashioned Taco Salad with Catalina Dressing and Fritos. Brown hamburger and onion in fry pan. Add taco seasoning, and water. Simmer until thick (about 15 - 20 minutes). Stir occasionally so it doesn't stick. Drain beans and stir into the meat mixture after it's thickened. Place lettuce in a large bowl and add beef and bean mixture. Mix in Catalina dressing, Fritos, chopped tomatoes and olives. Top with grated cheddar cheese. Spoon up a serving in your Corelle bowls or plates, pour a glass of Annie Green Springs cherry wine and you’ve got dinner. Or if you want to live in the moment, served on my Fiesta Ware plates with a glass of Australian Shiraz – delicious. So what were you eating, drinking and listening to in college? Old Fashioned Taco Salad Recipe…It’s What’s For Dinner. Looking for Southwestern style salads? 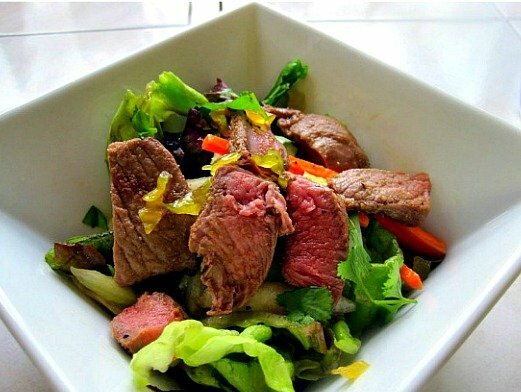 Try this Chipotle Glazed Steak Salad. I had a lime green polyester leisure suit and my son had one to match. There are pictures around, but I wouldn’t know where to find one – but I’d post it if i could find it – I liked that era. I’d forgotten all about those jeans. Did you make the matching halter top? I ate this salad more times than I care to remember. As for the Annie Green Springs, had a wee bit of that too, but just the thought of it now makes me gag! What the hell was I thinking? I did indeed make a matching halter top..LOL forgot all about those. They were easy to make. I agree, the thought of Annie Green Springs indeed makes me gag. Good lord, I can’t believe we drank that. Hi, you can still enjoy this taco salad and listen to Cat Stevens. Maybe we should have a 70s food get together? I remember bright green shoes, I was a little to young to make my own outfits yet (but I was around). We could dress up and bring one of our favorite “old” food favorites. Maybe at one of our next local food blogger meetings? Eating: Was just moving from having my mom’s cooking to learning to cook on my own so it was a hodge podge of boxed foods to my own omelets and burgers. Are you sure you weren’t wearing a jean skirt made from an old pair of jeans? What great memories! I think some variation of this salad was one of the first dishes I learned to make. I haven’t had it in years. Hmmmm… might just have to make a trip down memory lane myself! Like I said Liz, I may not have described the original just the way it used to be. I have to admit it tasted pretty good on the tostada version. I thrive on recipes from a simpler time and love watching my college age daughter discovering those of her own. As for Annie Greensprings, I was a Boone’s Farm girl myself, Country Quencher to be exact. Maybe that’s why I have such a love of hard cider, kinda reminds me of those days. Boone’s Farm Strawberry was my drink of choice…can you believe it? Then there was Cold Duck for special occasions, and an occasional Meteuse so we could save the bottle and put those drippy candles in it. Those were the days. What a fun post Lea Ann. I love taco salads and learned to make them from one of my roommates when I lived in Texas and was starting my career. Love Tex-Mex food. I’ve always used a Dorito style triangle chip and it would have had to have been iceberg lettuce because there weren’t many other lettuces available then. Lots of good memories in this salad. I didn’t know how to cook until I married, so as an ole southern girl I got through college on cheese toast and pimento cheese sandwiches. I swore I never wore bell bottoms, but my father-in-law has a picture of me in some very similar jeans, curly hair and looking a bit like a hippie. You’ve made your taco salad look very glamorous with the fancy salad mix and the organic tostado. I loved the flashback. This recipe looks great! we love this style food this is a quick dinner to make for my clan, love the colorful and presented way you put this together…very nice! Great looking taco’s! You ate much better in college than I did. but do I remember lots and lots of Kraft mac n cheese 🙂 Granola and yogurt! and I definitely remember Cat Stevens! I don’t think granola and yogurt were on my radar in the middle of Kansas. I sure learned to love them later. Thanks Carol. Taking a pair of Jeans and embellishing the heck out of them as always been fun. Too bad I don’t have a sewing maching, I might just join you. I recall making a lot of casseroles; I could eat the same thing every night and it didn’t bother me then; heck I still love leftovers today! I do recall Annie Green Springs, Mad Dog 20/20 and more but I wasn’t much of a drinker. I admit I enjoyed smoking something that made me much more crave sunflower seeds and M&M’s along with The Moody Blues. Long blonde hair, bell bottoms…yes I was a bit of a ‘flower child’ then! I gained 15 pounds my freshman year of college – I blame the school cafeteria. Lost it by my sophomore year – I learned to eat salads and soup. When I moved into my own place, I was B R O K E – so I ate a lot of burritos. brought me back to my early years in the States; I was discovering taco salad then, wow, time sure flies! I loved taco salad and yes, there was soggy old iceberg lettuce in a salad with hamburger. Funny memory. You know, my daughter went through the flowered fabric panel sewn into bell-bottoms in her ultra hippy phase. It’s how she taught herself to sew. Lastly, I couldn’t remember where I used to drink Annie Green Springs (the soda pop of wine) but now I’m pretty sure you introduced me to that pleasure. Fun post, LA! LOL, yes I’m sure this was my first flashback! Remember the big scare…”you’ll have flashbacks in your 50’s!! !” Oh no, I just hate being the Annie Green Springs pusher. I have to say, my grown up version was really quite tasty. Congratulations on winning Sam’s price! I’m in college right now and I would eat this in minute – even though I am an ‘older’ college student! I like the dressing in it – so different – in a good way! I haven’t made a salad like this in waaaaay to long. It is one of my favorites. I remember those days of bell bottoms and tye died T-shirts. I think I’m from a younger generation but I still play Cat Stevens in the background when I cook and I do love tie-dyes. This recipe looks delish! Love the picture! Looks tasty!